After testing numerous tools we found Stellar OST Converter which is developed by Stellar Information Technology – A Data Recovery Company recovering data since 1993. Stellar is the number one data recovery company having 2 million customers worldwide. Some of the top data recovery products of Stellar are Windows Data Recovery, Mac Data Recovery, Photo Recovery and iPhone Data Recovery. Also Stellar has the best video repair tool which has the capability to repair and fix damaged video files. Before we start discussing Stellar OST to PST software let ’s check what is an OST & PST file. OST stands for Offline Storage Table generated by Microsoft outlook when synchronized with Microsoft Exchange Server while PST stands for Personal Storage Tables also known as Personal Files and Folders. While doing a discussion with Senior Software Lead of Stellar he said Stellar OST converter has the capability to convert all the components of ost including emails attachments, contacts, calendars, notes, journals into PST file. The powerful algorithm of software repairs your damaged OST file and lets you convert into PST files. Allows you to convert password protected OST to PST file. Option of saving converted emais into MSG, EML, RTF, HTML or PDF formats. Watch the preview of your converted files before you save. Convert corrupted or inaccessible OST file. In what scenarios you need this software? Hardware failure occurs due to network failure or any inappropriate configuration of any of the external components of your system. These components include a hard drive, internal or external power unit, network connectors, and modem. If your OST file is stored in the drive which has some bad sectors then the data in that OST file got corrupted and you are unable to read. If you are not utilizing any antivirus or cleaner software that keeps your pc away from threats then there are chances some malicious files enter in your system without notifying you and corrupt OST files then in that case you need Stellar OST converter. Improper Shutdown of Outlook may lead to corruption of OST files. Sometimes when you exit without closing your outlook files and closing then via task manager can lead to corruption of files. Do you know what price you have to pay for Stellar OST to PST converter? 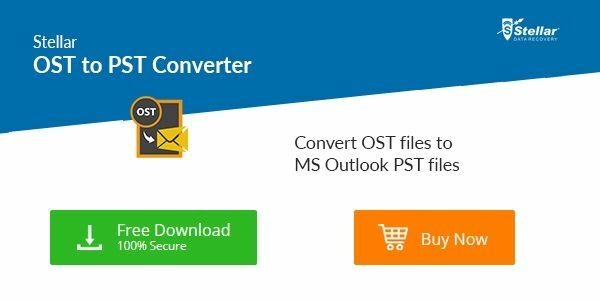 Stellar OST to PST is the best OST to PST converter which gives 100% assurance of fixing your harmed OST files and you can easily convert that into PST files. With demo version you can save 20 items per folder for free hence we strongly recommend you to check the demo and then purchase the software.